Frida Kahlo cut off her long hair after she was divorced from Diego Rivera in 1939. By doing this she rejected her femininity and ease her pain over the divorce. 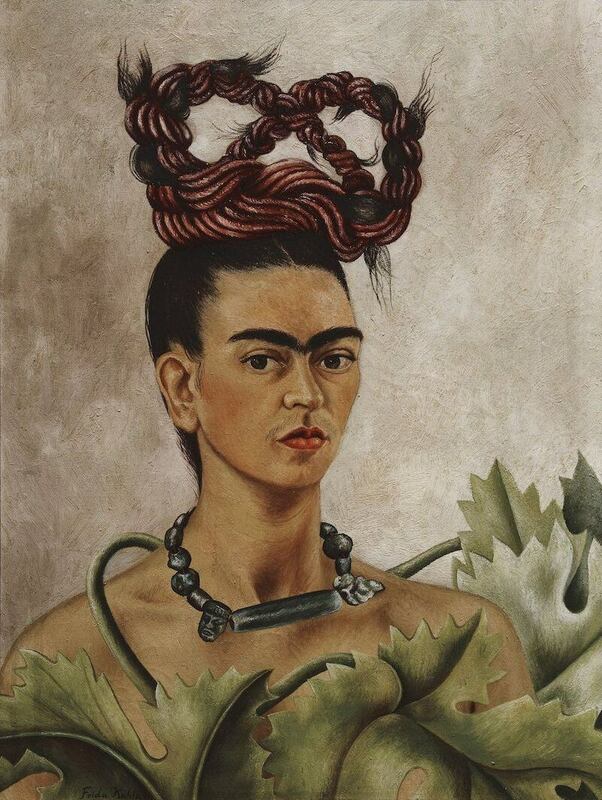 After they remarried in December of 1940, she painted this self-portrait and in it, using her hair to express her feelings about their relationship. The strands hair which were cut off as shown in her another self-portrait, "Self-Portrait with Cropped Hair", was gathered up and braided to an endless loop. The shape of her hair might be a symbol of eternal circle of time. The artist's naked upper body was surrounded with entwined leaves. In this painting, Frida was trying to gain her femininity back. In 1942, this painting was exhibited as part of the show "Twentieth-Century Portraits" at Museum of Modern Art, New York.